Wisconsin Crop Innovation Center (WCIC) holds a prominent place in Agricultural Biotechnology history. Originally known as Cetus of Madison, Inc. in Middleton, WI, the facility was started under the direction of former UW-Madison Emeritus Professor, Winston Brill in 1981 and owned by the Cetus Corporation of Emeryville, CA. The Wisconsin Alumni Research Foundation (WARF) played a key funding role in the early days of the company as well. Cetus of Madison, Inc. was initially focused on evaluating and testing a wide variety of natural rhizobium species to better understand their role in nitrogen fixation and nodulation in legumes with the hope of some day enabling maize to have that capacity. 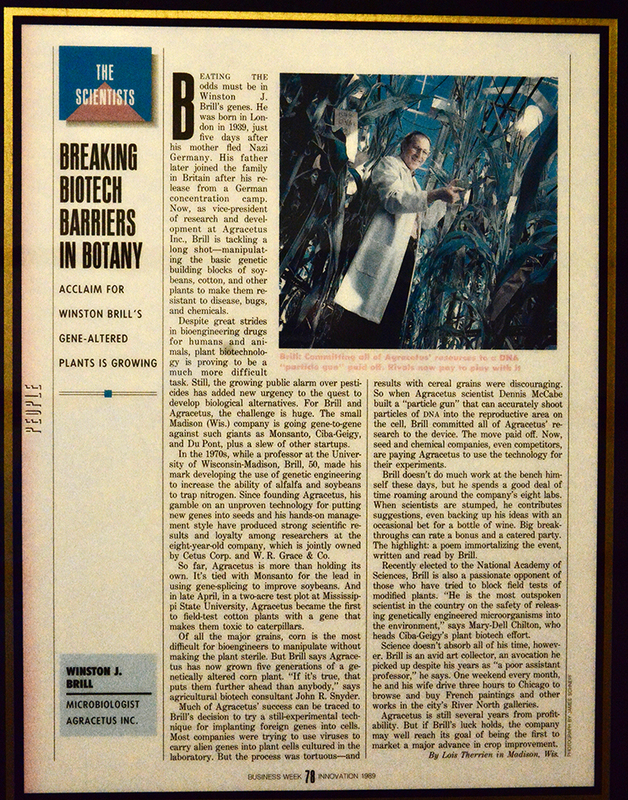 As the interest in biotechnology increased in the early 80s, the focus changed to inventing and innovating ways to introduce genes into plants. In 1984, Cetus Corp. sold half of its interest in Cetus of Madison, Inc. to the WR Grace Co. and subsequently the name of the company changed to Agracetus, Inc. (combining Grace/Cetus together). During this time Agracetus developed an electric “gene gun” and transformation methods that revolutionized the plant transformation process. Many plant species were subsequently transformed including; Tobacco, Peanut, Sunflower, Soybean, Maize, Cotton, Canola, Poplar, Wheat, Rice, among others. Research into cotton fiber quality, transformation process improvements, PCR method development, insect and disease resistance, and herbicide tolerance was ongoing in various labs in the facility. In 1990, WR Grace Co. acquired full ownership of Agracetus. During the early 1990’s Agracetus ventured into research in DNA vaccines (using their improved “gene gun”) and contracted their plant transformation services to others within the industry, including the Monsanto Company. After successfully generating plants that eventually became commercial products for Monsanto, including Roundup Ready Soybeans and Bollgard Cotton, the facility was acquired by Monsanto in 1996. Over the next 20 years, Monsanto used the facility as its primary site for soybean and cotton transformation. Other R&D at the site included, corn, canola, wheat, rice, and alfalfa transformation, gene expression, molecular testing, and seed chipping/genotyping. The site was considered a “center of excellence” for Monsanto due to its highly innovative employees, high throughput transformation capabilities, and its ability to consistently perform above and beyond expectations. In 2015 due to business consolidation considerations, Monsanto decided to relocate a number of their remote functions back to their main site in St. Louis, MO. Through negotiations with the University of Wisconsin and in hopes that the site would continue on for the betterment of agriculture, Monsanto generously donated the facility to the University Research Park and the UW-Madison in December, 2016.